Peel and dice onions. Quarter button mushrooms. Bring water to a boil in a small pot and cook two-thirds of the eggs for approx. 10 min. Remove from water, let them cool, then peel and dice. Heat some vegetable oil in a large frying pan. Fry onions for approx. 2 min. or until translucent, then add button mushrooms, season with salt and fry for approx. 10 min. Add cooked eggs and onion-mushroom mixture to a bowl, season with salt and stir to combine. Set aside. Add sandwich bread to a small bowl and let it soak in the milk. Add ground beef, ground pork, remaining egg, and soaked bread to a large bowl. Season with salt and pepper and mix with your hands to combine. Use your hands to form patties out of the meat mixture and flatten them. Add a tablespoon of the mushroom-egg filling to each patty, then add some more of the meat mixture. Seal so that the filling is secured inside the meat. Coat each roulade in flour and set aside. Repeat process until both the meat and filling are used up. Heat remaining vegetable oil in the frying pan over medium heat and fry the roulades for approx. 3 min. Flip and fry them on the other side for approx. 3 – 4 min. more. Add water to the frying pan, cover with a lid and let steam for approx. 5 – 7 min. 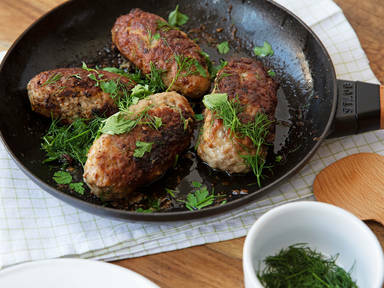 Serve roulades with fresh parsely and dill. Enjoy!